Every Rift Portal location on the map. Our Fortnite All Rift Portal Locations guide details the likely locations of all the Rift Portals across the map to help you complete this Week 5 Season 5 challenge. Looks like you'll have to seek out Rift Portals for one of Week 8's challenges too. Just to let you know that this guide is still very much your best bet for finding all the Rift spawns across the map! A major theme of the teasers leading all the way up to Season 5's release, Rift Portals are mysterious gatewats scattered across the map. Step through one and they'll teleport you into the sky so you have another chance at opening your parachute and repositioning. Turns out that Week 5’s challenge involves hunting these Rift Portals down and hopping into them. It’s easier said than done though, as these Rifts don’t spawn in fixed locations. This doesn’t mean there aren’t likely locations, it’s just that you can’t pin all your hopes on finding all the Rift Portals you need in only 3 attempts. While we can’t put together a definitive guide that’ll tell you exactly where to find all the Rift Portals, we can at least help you out by listing many likely spots you’ll bump into one. 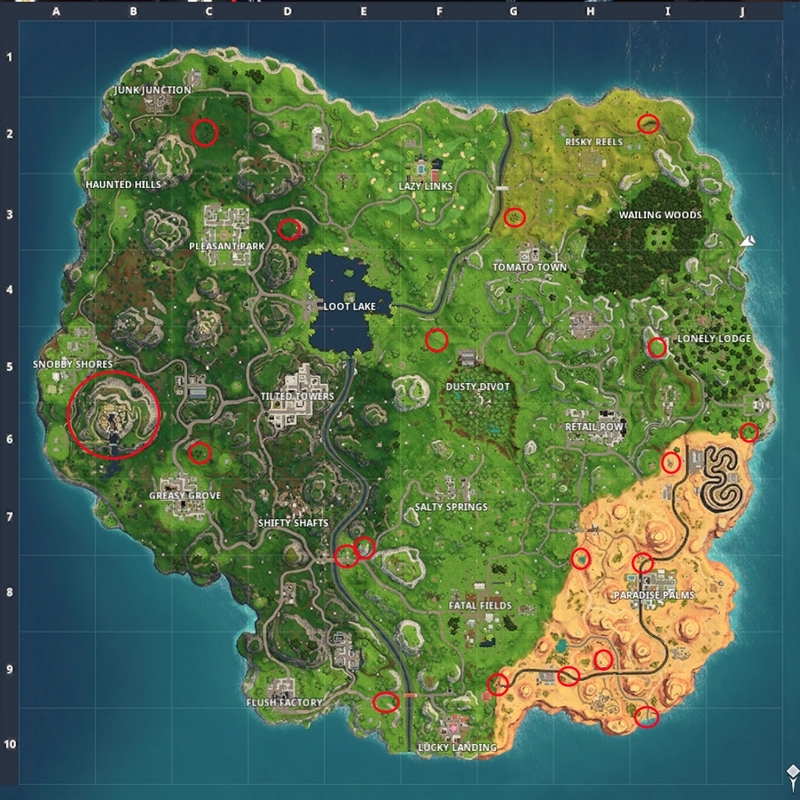 Thankfully some of the areas we've highlighted on the map below are usually home to at least one or two Rift Portals if you're lucky so it may not take as long as you think to complete this challenge. Make sure you head on over to our Week 5 Challenges guide for tips and tricks to help you complete every other task! If you're struggling to locate the hidden Battle Stars this week, you should read through our Snobby Shores Treasure Map Location guide as it contains a complete walkthrough! To complete this challenge you need to find 3 Rift Portals in total and use them. Progress is carried over between matches, so you won’t need to get this done in one sitting - thankfully! Here’s a map we’ve put together with all the circles in red highlighting areas which are usually home to a portal or two. Click on the image for a closer look. Again, Rift Portal spawns are randomly generated so don’t be disappointed if you’ve wandered all the way over to an area and one hasn’t appeared. Just keep at it and you’ll get there. Bring this map up on another screen while you play for ultimate efficiency! This video by Hidden Masters is also a great visual aid, make sure you give it a watch. If you found the video helpful, do make sure to give it a thumbs up and consider subscribing for more Fortnite content like this.